"Hi! I would love to have a boudoir photoshoot done and I think I want an album to give to my husband." So what's a folio box? Updated for 2017! What's inside a folio box? It will make you swoon. Each of your expertly retouched and printed boudoir photographs is mounted in a beautiful custom cut mat. Each is presented as its own art piece. 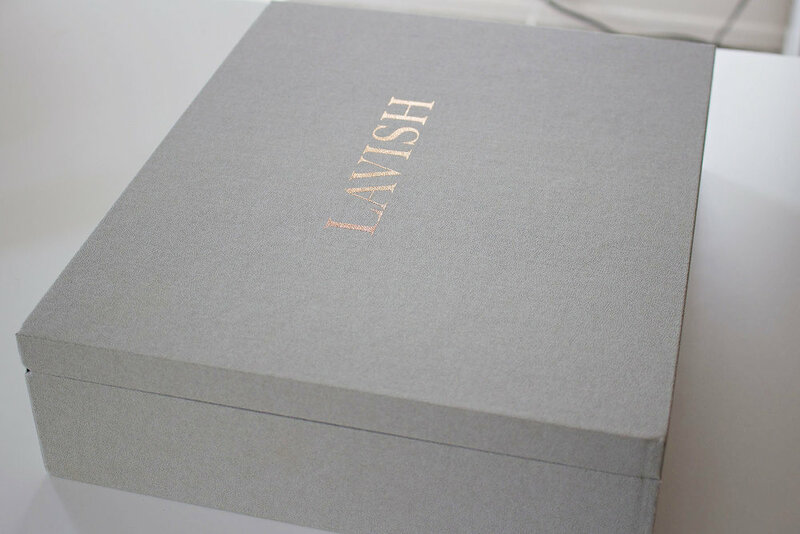 Those mats are carefully enclosed in this nubuck-wrapped handmade folio box. Anything you want. The matted photos can be framed for the wall, displayed bedside on an easel, tucked discreetly in the box so it's like opening a present every day, or you can even gift a print to someone else (particularly great when you have a beautiful g-rated portrait for your mom or daughter). But I really want to give him a little black book type album! Ahhh... for him. We haven't forgotten about the lucky guy. We offer gift albums a la carte that are made from the best materials, but are perfectly portable or night-stand-hidable. This way you can get that booty shot for him and the supermodel beauty shot for you. Call our Albuquerque boudoir and glamour studio at 866-930-7060 or see more info & a calendar here. Older PostWhy does mom always come last?